Add a unique look to your Saturn SKY or Opel GT! These awesome body side graphics are designed to fit perfectly on your SKY's lower front fender and door panels as shown. Starting solid at the front, the graphics gradually fade to the rear as shown. Available here in Black Fades (shown on vehicle). As an extra step, graphic pieces are over-laminated with a 2.5 mil clear gloss laminate which will protect the graphics from miles of abuse. Very easy to install, this kit is precut - NO TRIMMING required - and is set to be placed right at the SKY's distinct body line at the bottom of the door. 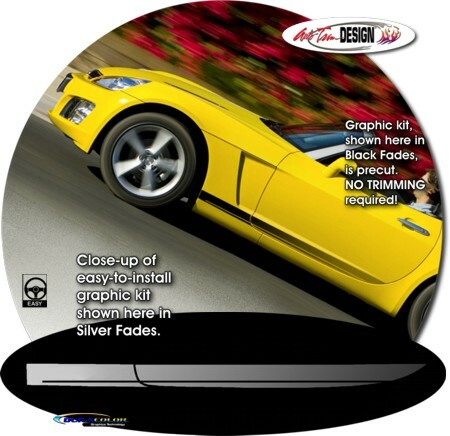 This graphic kit measures approximately 3.3" (8.38cm) in height and will fit any '07-'09 Saturn SKY or Opel GT. Easy to follow general online application and care instructions are included. Set yourself apart today! Note: Cutout is not provided for GM's small square logo located at each side of the Saturn SKY. Since logo is installed with double-sided tape, it can simply be removed and relocated for graphic installation.